I think we can all agree that food trucks are awesome. They provide convenient, delicious food that you can grab and go or sit outside and enjoy. Reasonable prices. Huge flavors. Easy cleanup. What’s not to love, right? Here in Baltimore, we’re lucky to be home to some of the greatest food trucks in the country. 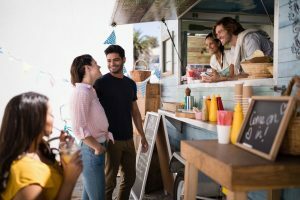 These mobile restaurants all post their schedules and locations on their respective websites, so make sure to check them out. You can also track them on social media … or just keep your eyes peeled around town. We had to start off with this amazing Diners Drive-ins and Dives powerhouse – or should we say, powertruck? Whether you’re here for the pork sandwich, the Carolina pulled pork, or the famous “Slap Yo Mama” Mac and Cheese, you’re not to be disappointed. Their small menu allows them to deliver some serious quality. Did someone say crab cone? That’s right: this queen of food trucks serves up a Baltimore-style crab cake on top of a waffle cone of hand cut fries for one amazing on-the-go lunch. Featured on the Food Network’s Chef Vs. City, this truck serves up street food from the executive chefs and co-owners of Helen’s Garden Restaurant. The menu regularly changes but the customer satisfaction always remains the same. This is a food truck you can truly feel good about going to. The Asian- and Latin-inspired cuisine is served up on compostable bowls, bags, and utensils. The Green Bowl truly lives up to its “green” name. Check out their award-winning bibimbap Korean rice dish or the Puerto Rican dish of fried mashed plantains called mofongo. A visit to Pablo’s Toc O’s truck is like having a culinary experience right on the streets of Mexico. They operate for all three meals of the day, and serve a variety of bowls, tacos, and platters. Pablo’s also offers vegan and vegetarian options, as well as gluten-free. There’s truly something for everyone at this fan favorite truck. Looking to bring out your inner-child? Quinn’s Ice serves up loads of soft-frozen ice cream deliciousness. But this is no regular ice cream truck. No, no, no. Quinn’s offers gourmet ice cream sandwiches that you’ll want to write home about. And with fall right around the corner, who wouldn’t want to use these last few warm days of the year to enjoy one of their strawberry Oreo milkshakes? One last thing: they have a glazed doughnut ice cream sandwich. Yup. Finally, the Taharka Bros. are famous for more than just their insanely delicious ice cream. The truck is also known as the “Change Maker Mobile.” It all started with a viral Kickstarter campaign that attracted noteworthy backers like Russell Simmons and Shaquille O’Neal. Their mission is to use their ice cream truck as a vehicle for social change. In fact, you can catch this particular truck on Sunday, Sept. 30 at the YNot Lot in Station North to host an ice cream social from noon to 5 p.m. They’re not only offering free scoops to the public, but also having food, music, and Q&A sessions to address local politics and culture. Taharka hopes to follow the path of Ben & Jerry’s by supporting local organizations and bringing attention to social issues … one scoop at a time. Real Estate Leader Josh Mente, is a founding member and owner of The MD Home Team of Keller Williams Excellence, and is responsible for business administration and marketing for the firm. Josh’s career path began in 1998 as a loan officer for Eastern Savings Bank, where he managed national accounts. He later joined Option One Mortgage originating more than 500 transactions per year valued at $100M+ in sales. In 2006, Mente shifted his expertise to real estate sales, gained his license and focused on buy/fix/sell transactions. Josh is a member of Elite Real Estate Network (ERN), the 2009 Rookie of the Year for Long and Foster corporate, and in 2012 ranked 206 and 2013 ranked 234 in Real Trends of the Wall Street Journal, ranking in the top 250 agents nationwide for all brokerages. From any early age, Josh was introverted and worked hard to overcome a fears of sales - a business that doesn't lend itself well to introverted people. When challenged by a manager that he didn’t have what it took for a specific job, Josh pushed forward and won approval in his new position. That was a pivotal moment that set the pace for his success in real estate sales. Having earned an AA degree from Montgomery College in business administration in 1995 and a Bachelors of Arts Degree from Towson University in Mass Communications 1997, Josh married his college sweetheart Melinda and they now have three wonderful daughters that provide the opportunity to watch them grow up and experience things for the first time. A committed sports fanatic, Josh spends time on the golf course, and follows the Ravens and Orioles as a season ticket holder. He is a part owner of two restaurants in Manhattan, enjoys music and time away with the family at their beach house in Rehoboth, DE. He hopes to find time for his hobbies that include building furniture, playing guitar, learning Spanish and flying planes.